This watch features a stunning blue galvanized dial along with a new home time indicator (now an icon in the shape of a house). 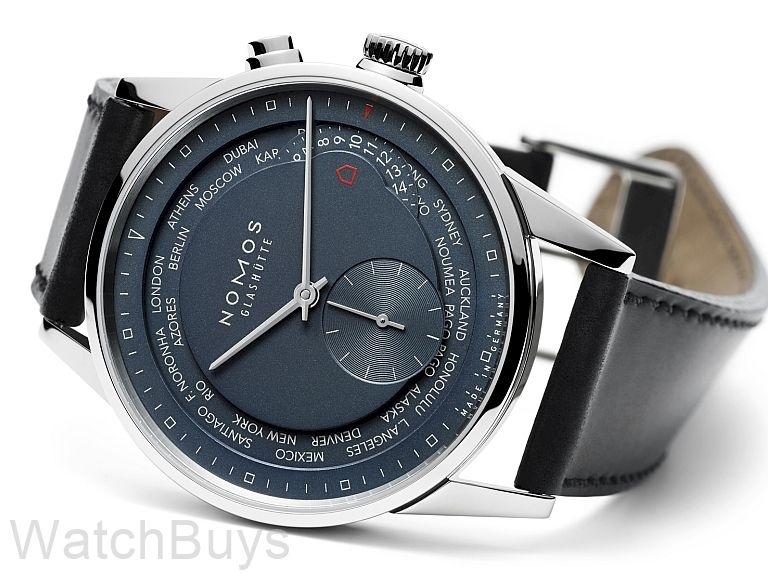 This watch also uses Nomos calibre DUW 5201 and incorporates the Nomos Swing System and escapement. This is one of our most requested Nomos watches and one of the most difficult for us to keep in stock. This is among the most complicated watches ever produced in the Nomos collection, and is what we call a "real world time watch". The moment you open the box, you're struck by both the beauty of the design, the fit and finish and the elegant way that Nomos chose to engineer the world time complication. To understand how this watch works, first set your "home time" indicated at the 3 position. The next thing you need to know is the arrow at 12. This arrow is the second time zone indicator, and shows the correct time for that city through the use of a pusher at 2. The trick is to first adjust the watch to your correct home time (through a small pusher at 7) and then use the 12 to see the time zone for the correct city. The late Hannes Wettstein, a renowned designer from Zurich, Switzerland drew up the plans for the case and his studio actually displayed the watch as part of the exhibition Neue Raeume - the leading design show in Switzerland. The case construction is quite intricate consisting of eight parts, and the design is among the most sophisticated that we've seen in a watch. The movement decoration is in the style of Glashutte, and is beautifully finished. Since this watch is the flagship of the Nomos collection, everything about this watch is pure class. The dial is galvanized while the hands are rhodium plated. The watch diameter is 40 mm and is topped with a domed sapphire crystal with sapphire crystal also on the back to view the beautifully decorated in-house movement. All of this packed in a case of only 10.8 mm tall. "Excellent - even better looking in person"
Verified Owner Comments: I would definitely buy this watch again. It has turned into my daily wear. I happen to travel a lot for work, so the timezone function is practical for me, but frankly I'd wear this watch if I never travelled. It does tend to run a bit slow I've been losing about 10 seconds a day. However, that's (barely) acceptable for me. It looks good even on my small (7) wrist, although I did have to purchase the smaller Nomos band to fit snugly.